Ab initio simulations of N2 interaction with the Ru/C12A7 catalysts. Character of the charge redistribution between C12A7 substrate and deposited Ru clusters is shown for the stoichiometric (a) and the electride (b) C12A7. (c,d) Adsorption energies of N2 on C12A7-supported Ru, charge transfer in the process of N2 dissociation (N2(g)+ Ru → 2N(ad) +Ru) and the corresponding energy gain (ΔE). In Ru/C12A7:O2– system (c), N2 and N accept electron charge from the Ru cluster, making it positively charged. In Ru/C12A7:e– (d), the electron charge is transferred from the substrate, leaving the Ru cluster nearly neutral. N2(g), N2(ad) and N(ad) represent N2 in gas phase, adsorbed N2, and adsorbed nitrogen atom, respectively. Studies by researchers at Tokyo Institute of Technology have developed a catalyst that is so effective at promoting dissociation of the nitrogen bond in ammonia production reactions that it is no longer the step limiting the rate of the reaction. Ammonia (NH3) is crucial for the industrial synthesis of fertilizers and pharmaceuticals so that ways to improve its production from molecular nitrogen and hydrogen are in high demand. So far the main challenge has been breaking the triple bond in nitrogen molecules, which is the strongest bond in a molecule of two atoms. Now a collaboration of researchers in Japan, the UK and the US have developed a catalyst that is so effective towards the break of the nitrogen triple bond and found that this is no longer the rate-limiting step of the reaction. Certain oxides can be very effective at enhancing the catalytic activity of ruthenium and iron but they are unstable in ammonia synthesis conditions. Recently the electride 12CaO·7Al2O3:e- (C12A7:e-) - an ionic compound with an electron acting as the negative ion – was found to be stable at room temperature. The discovery prompted Hideo Hosono and colleagues at Tokyo Institute of Technology and the Japan Science and Technology Agency in Japan, University College London in UK and Pacific Northwest National Laboratory in US to investigate Ru/C12A7:e- as a catalyst in ammonia production. The researchers examined the N2 isotope exchange and hydrogen adsorption/desorption reactions. They observed a remarkable level of catalytic activity at less than half the activation energy of other catalysts. In addition the catalyst did not degrade due to hydrogen poisoning as is usually the case for ruthenium-based catalysts. Further studies and density functional calculations suggested a mechanism for the reaction. "Fast N2 cleavage is ensured by highly efficient electron transfer from C12A7:e- to N2 molecules adsorbed on the Ru nanoparticles," the researchers conclude in their report. 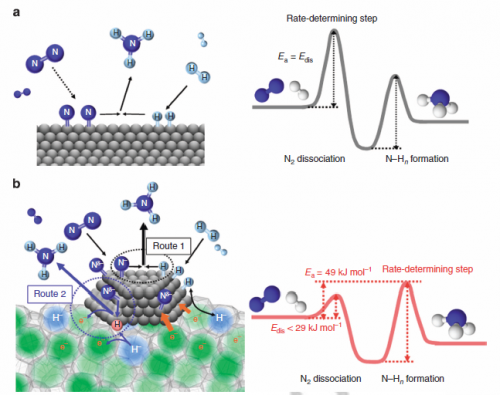 "As a result, the bottleneck in the NH3 synthesis reaction is shifted from the N-N triple bond dissociation to the formation of nitrogen-hydrogen species." Both iron and ruthenium are well known catalysts for the break of the nitrogen bond. However ruthenium-based catalysts are highly prone to hydrogen poisoning where hydrogen adsorbs to the catalyst, so that for over a century iron-based catalysts have remained central to the widely implemented ammonia production process developed by Fritz Haber and Carl Bosch in 1909. Proposed reaction mechanism and energy profile for ammonia synthesis. Reaction mechanism and energy profile for ammonia synthesis over (a) conventional catalyst and (b) Ru/C12A7:e-. (a) N2 and H2 react on the catalyst surface through a Langmuir–Hinshelwood mechanism to form NH3 in which N2 dissociation is the RDS. The energy barrier (Edis) for this step corresponds to the apparent activation energy (Ea) for ammonia synthesis. As for Ru/C12A7:e- (b), the rate-limiting step is not N2 dissociation but the formation of N–Hn species. NH3 is formed through the Langmuir–Hinshelwood mechanism (route 1) and the direct reaction of N adatoms with H radicals (nascent hydrogen) derived from cage H_ anions (route 2). Ea is determined by the difference between the top of the barrier for N–Hn formation and the energy level of reactant molecules (N2 and H2). Alkali and alkaline earth metal oxides enhance ruthenium and iron catalysts by donating electrons into the 'antibonding orbitals' of the nitrogen, weakening the bond. This is referred to as the electronic promoting effect but has so far been difficult to harness for ammonia synthesis because the oxides are unstable in the reaction conditions. The promoter the researchers investigated is a combination of oxides of calcium (an alkaline earth metal) and aluminium in the form of an electride - 12CaO·7Al2O3:e- (C12A7:e-). The same ionic compound can be used with oxides or hydrides acting as the anion instead of an electron as in the electride studied, but these are far less effective. The crystal structure of C12A7:e- consists of a positively charged framework having the chemical formula [Ca24Al28O64]4+, and four extra framework electrons accommodated in the cages as counter ions. This structure has uniquely versatile characteristics for the exchange of negatively charged ions. The researchers monitored N2 isotope exchange and hydrogen adsorption/desorption reactions. From these observations the researchers determined that breaking the nitrogen triple bond was no longer the rate-limiting step of ammonia synthesis with the Ru/C12A7:e-. Instead they suggest that the subsequent formation of the nitrogen-hydrogen bond in ammonia is now the bottleneck in the process. The researchers also calculated the order of the reaction from the effect on the rate as the concentrations of the chemicals were varied. The catalyst had a lower reaction order for nitrogen than other catalysts suggesting a different mechanism, and that the nitrogen populates the catalyst more densely than for other catalysts. The Ru/C12A7:e- catalyst was not subject to hydrogen poisoning and remained active at high pressure. 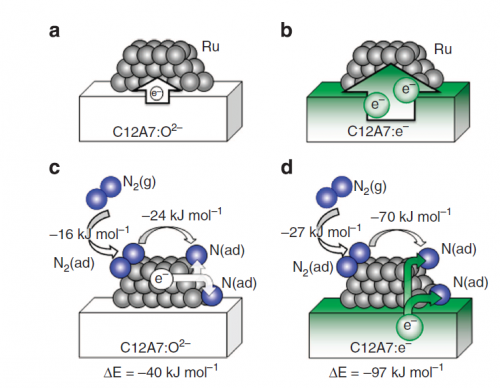 The researchers suggest that the fast formation of ammonia on the ruthenium surface limits hydrogen being incorporated into the catalyst so that its activity remains unchanged. Further studies suggest that the reversible hydrogen storage-release properties are responsible for the reaction mechanism of the new catalyst. This mechanism switches at temperatures below 593 K at which temperatures the catalyst becomes prone to hydrogen poisoning like other catalysts.